Your style is a reflection of you. Keep it authentic and take control with Braun’s ultimate face, hair and body styling and grooming options. Regardless of your facial hair style, the Braun Multi Grooming Kit helps to create a defined look that's all your own. 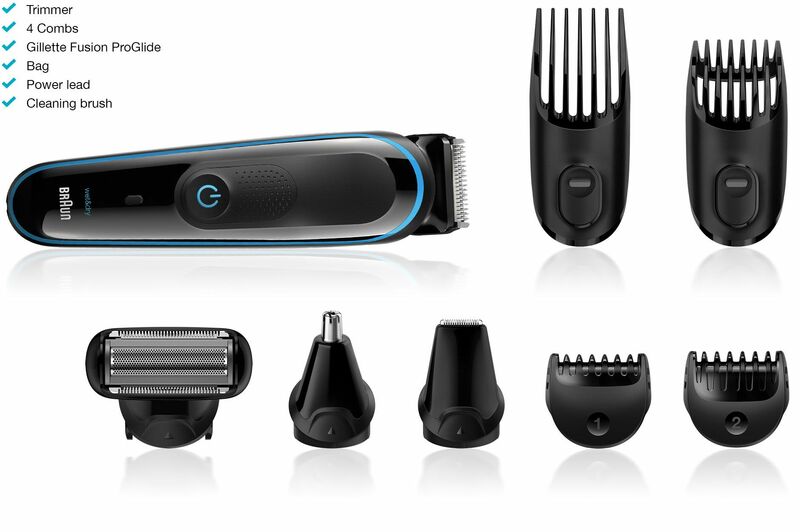 A smart hair clipper comb gives you the precision and control you need to create a great hair cut. Clip your hair to the style that most suits you using 13 precise length settings between 0.5mm and 21mm. The Braun multi grooming kit’s body grooming attachment helps you control the look of your whole body, safely and accurately. Provide high performance precision for all trimming needs. The stainless steel blades ensure even long or thick hair isn't a challenge. A 1-hour charge gives you 60 minutes ofprecision grooming. LED indicator displays battery status. *Individual models come with a varying number of accessories. Simply go to the comparison page for your ideal choice. Your look your way. Ultimate control to perfect your style for face, hair and body.